I’m back. Finally. Been writing, but for other purposes, work that needed done. Unfortunately, it kept me from hangin out with you. I’ve missed you. Several people have reminded me lately that I haven’t written; it’s time. If you talked to me yesterday, the name of the column would have been, The Women, that’s what’s been in the pipeline; but on my two-hour drive home from the old hood today, another blog stepped in. Ladies, you’ll get your due, but first things first. It was one of the females from, The Women, who got me thinking in another direction. A person who’s made several appearances in the blog, AK; she had a birthday this past week, gave her a call to shower some b-day love. Before I go on, a bit of recap is necessary. AK is quite possibly one of the funniest people in the world. No exaggeration. This is a rare mind, one that has a quip or a comical comeback for even the most serious of topics. Her levity has always been strong medicine; it’s her MO. Lately, the prescription has changed. The world is doing a number on her; on us all. The last couple times we’ve talked, the conversation took a different turn. Her light and playful spirit has been replaced by a deep concern for the world. Oh, she still gets some classic zingers in; but her heart is weighed down by all the negativity around us, she’s even mentioned the possibility that we’re beyond hope. Wait a minute, this is AK we’re talking about. She sees the jollity in everything. If she’s doubting the future of the world, we’re in trouble. Humor has been kidnapped; we’re an angry society. Anger is the new black. We wear it like the latest fashion statement. Everywhere you turn, people are angry; forget humor, there’s not even a smile to be had. It’s damn near impossible to get people to even look at you, let alone return a smile. Make a point of trying to smile at every person I pass on the street, and the reciprocation is dismal. Give it a try, it’s pretty disheartening. People today avoid looking at each other. Why? It hasn’t always been like this, where did we go wrong? I have a theory ~ permeation. Could get all scientific on you, but the easiest analogy is the Kool-Aid Man, you know, the beloved pitcher of red sweetness, who came on the scene in 1954, crashing though walls to say, “Oh Yeah”. (He has since adopted a kinder, gentler approach.) The transformation of that bulbous visual aid is what I’m talking about. If you pour enough red into a clear host, the color takes over. Our current political climate is bright red; saturated with anger. And it’s only compounding our problems. Anger begets anger. There’s been so much of it in recent history, the world is seeing red. We’ve been infiltrated by negative thinking; and the more we contribute to it, the darker things get. Tough to avoid, though, especially when you’re saturated. It hangs in the stratosphere, just waiting to invade the next thought. Spreads like a cancer. No wonder the world is in such dire straights, we’ve annexed the air; unwittingly created a pervasive atmosphere of antagonism. If it continues to perpetuate itself, AK might be right. So what do we do? Tough spot. Gonna have to start small and work our way clear; if we got here, we can get back. Might as well try, what do we have to lose? Let’s weight it: an angry society that ends up imploding on itself, or a peaceful existence. Sounds like a hard choice to me. (Never said we couldn’t be sarcastic.) Kidding aside, it’s time for a new mindset, one person at a time. Alter the permeation, imbue the world with consideration and self-control. #TeamTemperance; restraint from retaliation and excessive anger. We need to start resting in a little reason. It's gonna be work to get the red out. But, let's be real; how important is that angry response anyway, is it even necessary? Could it be reasoned out? Maybe we can stop choosing to see the worst in people and look for the best. There are some pretty cool people in this world, if we’re always looking for what’s wrong with them, we miss everything that’s right. And maybe our opinions are just that, ours. There’s enough room for everyone to have one. Everything doesn’t have to be a fight. Rarely pick one, but my dukes shoot up when I’m confronted; but even that makes the water a deeper red. I need to join #TT. It's not going to be easy, red is a persistant color, but do we have a choice? Maybe, just maybe, we can start with something as simple as a passing smile on the street. 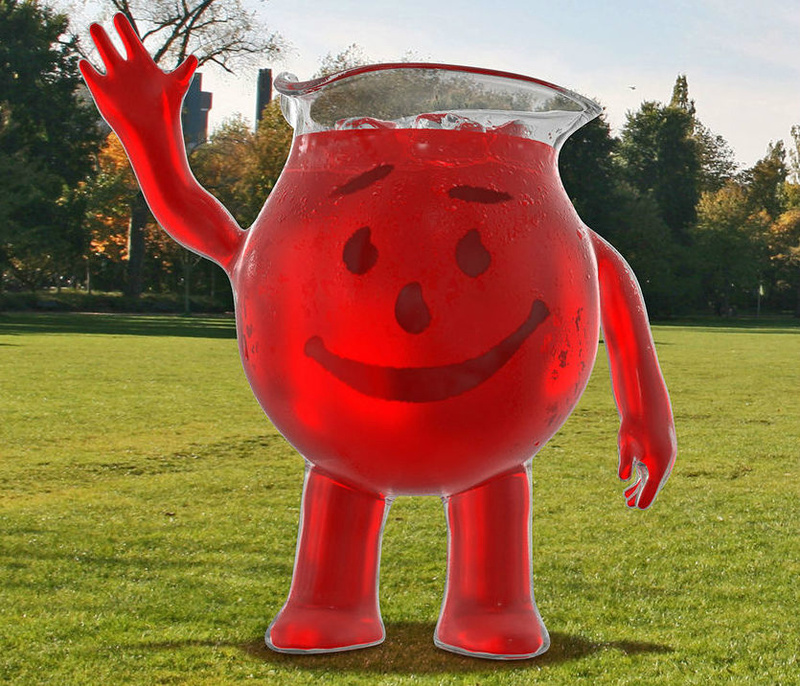 Even the Kool-Aid Man knows how to do that.